The best place to start is with Secrist's world famous DVDs below! 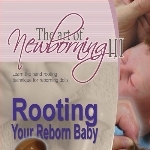 Use the links above to see some of Secrist's other reborning resources and ideas. 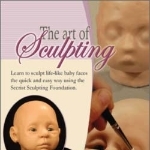 Course #1 DVD teaches a miniature three step version of the reborning experience as you make a six inch baby in less than�two hours: can work for ANY size doll or baby sculpt from 4" to 22" in height. This DVD reveals many secrets to making award winning newborn dolls including how to mix your own paints, special shading, color wheel theory, and more. 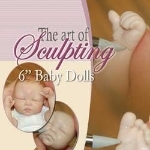 This easy to follow DVD can teach beginners and professionals alike to sculpt a 6" baby doll. Spanish and Portuguese reborners can learn the art of newborning in their own language. Click here to watch a sample online now! Frequent close ups make for highly detailed training with this DVD. Click here to watch a sample of this video online now! Root like a pro with the techniques in this DVD. Now YOU can choose what you would like to learn! 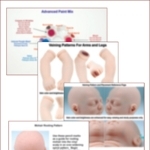 Learn the entire process of making a complete doll from scratch�taught by�one of the nation's preeminent doll artisans. Learn the entire process of making a complete mini doll from scratch taught by one of the nation's preeminent doll artisans. Back in stock! Limitied quantities! 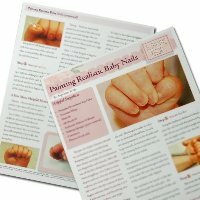 An 8.5" x 11" glossy photo study guide, with extreme close-ups of real babies' eyelid colors, eyebrows and micro veins. Use this photo study guide to make your baby more life like. Where should the hair line be? Where should the rooting start and what pattern or direction should it go? Where should the crown of the baby's head be? These are the kinds of questions and more that can be answered when studying the Rooting Pattern technique photo sheet. Where do you put the veins on a baby's limbs? How many do you put there? 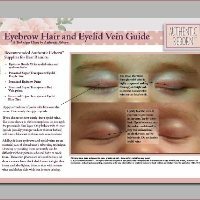 The Veining Photo Technique Chart shows you exactly how many veins there are and where they should go. 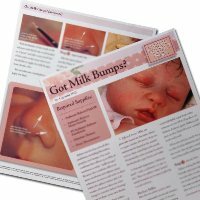 Guidance charts can help you perfect the realism in your reborning! The Head Veining technique sheet comes printed on an 8.5" x 11" gloss paper. Veining chart also available for the limbs. 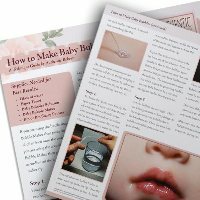 Baby bubbles can be very difficult to create in a reborn baby.� Learn the secrets to using the Baby Bubble Maker and the Baby Bubble solution.� Made of a durable 65# matte card stock, 8.5" x 11" two-sided. 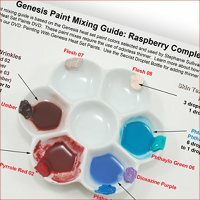 This is the Raspberry Complexion paint mix chart used in our very popular DVD “Painting with Genesis Heat Set Paints”. This paint chart shows you what to mix for to achieve the Raspberry Complexion. Printed on 8.5" X 11" gloss paper. Learn what Genesis colors Stephanie Sullivan mixes together to create blush, lips & nails, creases & wrinkles, internal purple wash and veins. 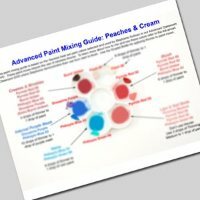 Learn what colors to mix for your own Peaches & Cream complexion paints. These are the paints and mixes that she uses in our instructional Advanced classroom DVD. Learn from the master reborner. Printed on 8.5" X 11" gloss paper. Does your reborn baby wear designer shoes? Too expensive you say? Not now! Learn how to make your own reborn baby's shoes look just like designer shoes. Why pay more? Learn the "how to" secrets.